Marriott Rewards today announced their latest MegaBonus that is valid for stays between January 16 – April 15, 2018. Members can earn 2,000 bonus points starting from their second stay and 1,000 bonus points if their stay include weekend night (Friday, Saturday or Sunday). You can access and register for this promotion on Marriott’s website here. Note that you can earn up to 50,000 bonus points under this bonus offer. This is a decent offer for one night weekend stays that basically yield 3,000 bonus points per stay. Marriott Rewards has tend to have sometimes targeted offers as well. I am not sure if they have this time as well. *A ‘stay’ is defined as consecutive nights spent at the same hotel, regardless of check-in/check-out activity. A weekend night is defined as a Friday or Saturday night except in the Middle East and Egypt in North Africa where it is defined as a Thursday or Friday night. • Marriott Rewards members who register for this promotion by March 31, 2018 will earn 2,000 bonus points per stay beginning with their second stay* made between January 16, 2018 and April 15, 2018, at participating Marriott® properties, plus 1,000 bonus points when the stay includes a weekend night. • A weekend night is defined as a Friday or Saturday night except in the Middle East and Egypt in North Africa where it is defined as a Thursday or Friday night. • The maximum amount of bonus points that can be earned with this promotion is 50,000 points. • ExecuStay, Marriott Executive Apartments and Marriott Vacation Club® owner-occupied weeks are not eligible for credit and nights spent while redeeming an award are not eligible for credit. 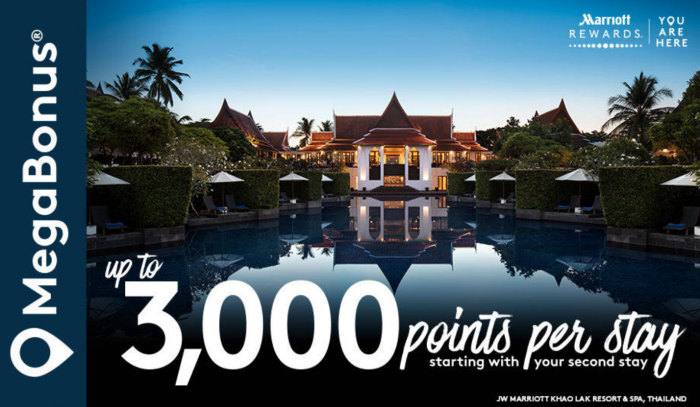 • See http://www.marriott.com/rewards/terms/earning.mifor more information. • Visit www.MarriottRewards.com/3kMegaBonusor call 888-MARRIOTT (888-627-7468) for complete details.